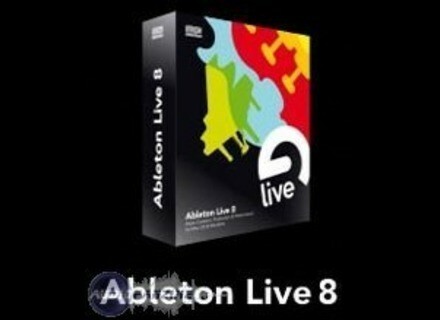 Live 8, General Sequencer from Ableton in the Live 8 series. Product replaced by the Ableton Live 10 Standard. 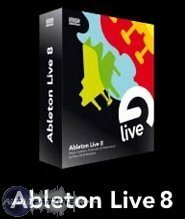 Ableton has updated Live to v8.0.3. Slightly improved graphic performance on Mac OS X. Setting up a cache folder is restricted to an empty folder or previous cache folder. Root directories are not longer allowed. On Mac OS X, "Move to trash" and "Show in finder" command would not work when particular toll are installed. (e.g. PathFinder). The unfrozen-state of a track would not be saved properly within a Live set. Opening a particular set would crash as soon as the clip detail view of a particular clip would be opened. When committing grooves for audio clips, the created volume clip envelope could produce audio clicks. The "Auto" switch of racks would not always work properly. When moving the mouse over Macros, the the name of the corresponding macro would not always displayed in the status bar. In the Operator, the Notch filter display would not be displayed properly. MIDI note preview would not always play all notes when moving the insert marker with arrow left/right. Arranger recording of an unwarped clip could result in different playing offsets. In the file manager, the project and library link would not work. Installing a Live pack fails when one of the installed samples is already in use. MIDI step input would sometimes happen when it should not; for example when just playing a note while there's a time selection, or when pressing keys other than arrow left and arrow right. MIDI step input would also generate undo steps even if nothing happened. When scrubbing in the Arranger, sample pre-loading would not always work properly. Transport controls of certain controller surfaces would not work properly. Playing back a particular audio clip in Beats warp mode would lead to disk overloads on loop back jump. Under certain conditions, Collect and Save would copies no longer used audio files of frozen tracks. Slice to MIDI track on audio clip might crash Live. The voice stealing mechanism of the Impulse would not always work properly. In the Vocoder, several parameter would appear with different names in the automation chooser compared to the names from the info text. In the Multiband Dynamics, several parameter would appear with different names in the automation chooser compared to the names from the info text. Creating a MIDI track via double click on an instrument preset in the Browser would not work when a Return or the master track is selected. The Session view scrolling with the APC40 would not always work properly. Third party plug-in offering more inputs that outputs could crash Live. Pasting a Live set from the browser into the current Live set would select and scroll to a slot in the last scene. Not quantized arranger scrubbing would not work properly. Slicing audio file using a slicing preset containing two levels of nested racks with cascading macro mappings would crash Live. Dragging a clip from a Live set in the browser to the empty arranger area would not work sometimes or even crash Live. Having an unwarped clip which spans more than the whole range of its next clip. Copying both of them are could crash Live. In the browser, collapsing a folder while renaming contained file after exporting a clip or track into that folder could crash Live. Play through optimization would not work properly for audio monitoring and recording, resulting in high latencies. Loopmasters Strictly Hip Hop Loopmasters has released its new Strictly Hip Hop collection. Sibelius 6 Avid has unveiled version 6 of Sibelius music notation software. Iliadis EfthimiaSM & VH-2 [Freeware] Iliadis has announced the release of EfthimiaSM, a new free organ VST instrument plug-in for Windows, and that VH-2, another organ plug-in, is now also available for free (it was €15 donationware).